In another blow to the alarmist fallacy that the current warming period is 'unprecedented' or 'unusual,' a paper published today in the journal Climate of the Past finds that winter temperatures in China warmed at a rate almost three times faster over the 100 year period from 1862 to 1961 [1.89◦C/century] than over the 100 years from 1901 to 2000 [0.66◦C/century]. Furthermore, the reconstructed temperature anomaly at the beginning of the study period in 1736 [during the Little Ice Age!] was the about the same as in 2007. From the conclusion: "The overall pattern of winter temperature variations during the past 300 yr is shown here. The climate in the 18th century was in a relatively cold phase, with a −0.76◦C mean temperature anomaly observed (for the reference period of 1951–2007). Then, in the 19th century, the climate enters the coldest period since 1736, showing a −1.18◦C mean temperature anomaly, and this century has been recognised by most reconstructions performed for the Northern hemisphere and China as one of the coldest (Jansen et al., 2007; Ge et al., 2010). Since the 20th century, the climate has entered a warming period. In particular, the mean temperature from 1981 to 2007 was 0.25◦C higher than that of 1951–2007, which reached the highest level of the past 300 yr. The warming rate during the 20th century from 1901 to 2000 was 0.66◦C/100 yr, which is lower than that from 1862 to 1961, when the rate was 1.89◦C/100 yr."
Top graph is a blowup of the 1950-2007 period and shows no warming. 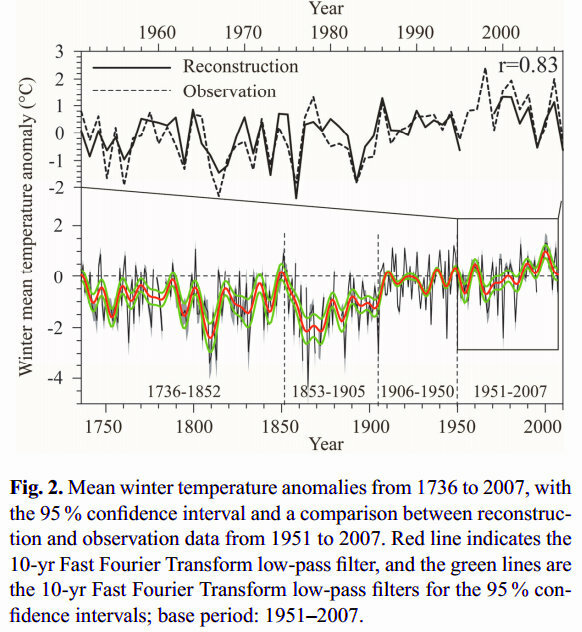 Bottom graph shows winter temperatures in 2007 were the same as multiple points within the past 300 years including the beginning of the studied period in 1736. Abstract. We present statistically reconstructed mean annual winter (December–February) temperatures from the middle and lower reaches of the Yangtze River (24° N–34° N, 108° E–123° E within mainland China) extending back to 1736. The reconstructions are based on information regarding snowfall days from historical documents of the Yu-Xue-Fen-Cun archive recorded during the Qing Dynasty (1644–1911). This information is calibrated with regional winter temperature series spanning the period from 1951 to 2007. The gap from 1912 to 1950 is filled using early instrumental observations. With the reference period of 1951–2007, the 18th century was 0.76 °C colder, and the 19th century was 1.18 °C colder. However, since the 20th century, the climate has been in a warming phase, particularly in the last 30 yr, and the mean temperature from 1981 to 2007 was 0.25 °C higher than that of the reference period of 1951–2007, representing the highest temperatures of the past 300 yr. 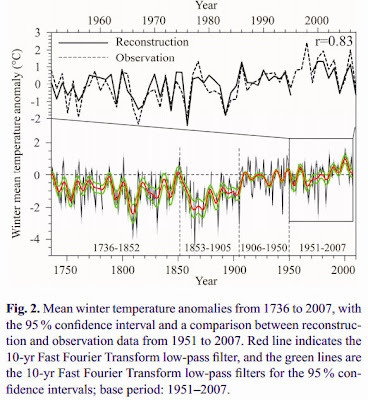 Uncertainty existed for the period prior to 1900, and possible causes of this uncertainty, such as physical processes involved in the interaction between temperature and snowfall days and changing of observers, are discussed herein.